Today’s story is not directly related to my usual topics of voiceover, marketing, or audiobooks. Instead, it’s a Law of Attraction story that I hope encourages and inspires you to do what you love and pursue your dreams because you just never know where they will lead! In addition, you’ll be able to see some Law of Attraction principles at work that you can use in building your voiceover career or pursuing any other passion. First, it’s important to note that many people confuse the Law of Attraction with instant gratification. It’s not enough to WANT it. You have to DO SOMETHING about it! If you look at the word ATTRACTION, you’ll observe that the root word is ACTION, not GRATIFY. As this story illustrates, the results of the Law of Attraction are evident only after taking consistent action over a period of time. 1. If you have an idea to try something new, try it — you might like it. 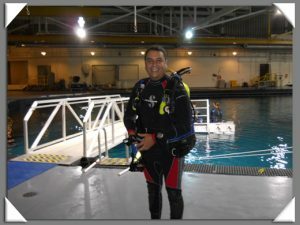 Drew started scuba diving in 1983 just because he and his college roommate thought it would be a fun thing to do. Since we live in Atlanta, you can imagine that his opportunities to go diving were somewhat limited. However he took special diving trips as often as possible and would go diving on our vacations. He didn’t seriously pursue diving until we went to Hawaii in 2000. I see many introductory, 2- or 3-hour voiceover classes offered these days. I always encourage people to take these kinds of classes and read books on voiceover to get a taste of what the job is like. 2. If you like it, take specialized classes to learn more about it and master new skills. As the number of his dives increased the past few years, Drew kept taking specialty classes. He talked for years about getting a Dive Master rating even though he had no place to use it. Note that he continued to take classes in an interest that was merely a hobby. If you are planning to enter a new career, such as a job shift to voiceover work, additional instruction will be necessary to gain subject mastery. 3. Even if your dream seems impossible, don’t give up. The forces of the Universe may conspire to help you achieve it! In 2005, the world’s largest aquarium was built in — you guessed it — Atlanta. Yes, Atlanta! Almost unbelievably, land-locked Atlanta, which is at least a 5 hours’ drive to any ocean, is the home to the world’s largest aquarium, with mammoth exhibits housing some of the world’s largest marine life. The largest exhibit holds OVER 6 MILLION GALLONS OF WATER and 4 whale sharks, which will grow to be the size of city buses! These whale sharks came from Taiwan, and most people would never have the opportunity to see them and the other amazing animals that are all living at the Georgia Aquarium. 4. The right people and information will come into your life when you least expect it. Long before the Georgia Aquarium opened at Thanksgiving, 2005 — in fact, in 2003 or 2004 when construction was still underway — a friend mentioned to Drew that he was going to apply to volunteer at the Aquarium. He hoped to be a scuba diver. Until that day, we hadn’t heard much about the Aquarium, but that one sentence was all Drew needed to hear. He immediately contacted the Aquarium and started the volunteer application process. 5. Persistence of follow-up action is a key ingredient to success. Thousands of people applied to be volunteers, and the resulting screening process was often disorganized and chaotic. Drew repeatedly followed up with the coordinators when he didn’t hear anything. He made sure that his application was processed and that he did everything he needed to do in order to become a volunteer. He had to pass a background check and drug test before they ever cleared him to take classes on the animal habitats and guest relations. Our friend, in contrast, filled out an application and simply waited for someone to get back with him. Since he didn’t follow-up, he is no closer to volunteering that he was 5 years ago. Meanwhile, Drew’s volunteer work started during the pre-grand opening days for annual pass holders. He was in on the ground floor of this amazing new Aquarium! 6. Volunteering is a great way to get more of your passion in your life, as well as gain experience needed for a job shift. Drew did anything he could to get his foot in the door, hoping that maybe at some point he would be allowed to dive with the Aquarium. Everyone told him that he would have to volunteer for at least a year before they would even consider taking on volunteer divers. He originally volunteered primarily in the IT and Special Events departments. In February, 2006, after the Aquarium had only been open for 3 short months, Drew received notification that he could apply to be a volunteer diver! The Aquarium has extremely strict rules about its dive staff as the Aquarium must comply with OSHA requirements. If Drew had not continued to take diving classes and upgrade his certifications in the preceding few years, he would not have been eligible for consideration for the dive team. Even so, he still had to take some Red Cross first aid classes and pass a grueling swimming test. Once he passed those tests, he had to pass a physical exam. We both were beyond thrilled when he passed all of the requirements and was certified for diving with the Georgia Aquarium! I am a firm believer in volunteerism. Before I ever took the first voiceover workshop, I volunteered for 5 years as a reader and producer for the Georgia Radio Reading Service. Through my volunteer work, I gained clarity about my desire to become a full-time voice talent. 7. Get a support team in place to cheer you on. Some of you know that Drew was laid off in July 2009 from his position as a lead senior software engineer by ADP, his employer of 12 years. We thought his job was secure and never saw the layoff coming. He was let go at lunchtime on a Thursday, and he called me while on his way home. From the moment he told me the shocking news, I told him that the layoff could be the best thing that could happen to him. I encouraged him to do what he wanted to do instead of feeling that he had to take a job just to make money. My positive reaction was no surprise to Drew. We have always been champions of each others’ dreams. I’ve written previously about relationships that change or disappear in the pursuit of your dream. For this reason, you need to be careful about the people in whom you confide your deepest dreams. If your family and friends are not supportive of you, it just makes your success more difficult to achieve. In the voice-over world, you can join numerous on-line forums to discuss your progress with and learn from peers. You’ll find several of these forums listed on the right panel of my blog. 8. Investing in your dream is an investment in yourself and a life you will love. Initially, Drew said he would still pursue a job in software development. At the same time, though, he decided to fulfill a long-held dream to get his Dive Master rating. ADP paid him for his unused vacation time, and Drew used that money to take the certification class even though he didn’t have a specific plan to use the certification. He finished the certification in March. I also have cashed in vacation time and money to progress my voiceover career. It may seem like a sacrifice to give up a trip in exchange for a career-enhancing workshop. However, I have never regretted any decision made in favor of my dreams. 9. Listen to that small, still voice in your head, and let it guide you in times of doubt. After going on an interview in the fall for a developer position that seemed if it had been written to match his qualifications and was located only 3 miles from our house, Drew confessed that he did not really want to go back to corporate software. I encouraged him again to find a job he would enjoy rather than one done for the money. We decided he should consider himself retired from corporate software and concentrate on getting a job at the Aquarium, where he had been steadily volunteering as a diver for over 4 years. We restructured our finances to pay off some obligations, which allowed us to live comfortably on my income. I heard Joel Osteen say recently that our creator does not give you the vision without also giving you the provision for making it happen. In 2008, the Aquarium started the Dive Immersion Program, where members of the public pay a fee for the opportunity to swim or dive in the main exhibit with the whale sharks, sharks, manta rays, and other exotic creatures. Drew had wanted to be part of that program since its inception, but he couldn’t participate as a volunteer. Until he changed his mindset about the salary he could accept, he felt he couldn’t work there, especially since most of the staff only works part-time. 10. Continue moving in the direction of your dream, even if you can only take baby steps. Drew had expressed his interest in the job and maintained contact with the department manager during his volunteer stints. Once he finished his Dive Master certification, he notified her about his upgraded qualifications. She told him to submit an application even though they currently had no vacancies. However, things moved FAST from that point! She called him the day after his birthday to tell him he was scheduled for the preliminary — and intense! — swim and diving skills test. (Happy birthday!) After passing the tests, he had to give a small presentation as if he were meeting the public. At that point, they invited him and 2 other people who had passed all the tests for an interview. He had the swim tests, presentation, and interview on Monday 7 June. At the end of the week, he had the DREAM JOB! In truth, Drew never really dreamed of being a professional scuba diver. He just didn’t see how it could work out given our distance from the ocean and the part-time nature of the work. His story shows that when you give up the HOW and focus on the WHAT of your desires, the Universe can fulfill the order in a way better than you could have dreamed possible! It also shows that you can do what you love as a volunteer, but you may be able to convert that volunteer gig into a paying gig. If any of you are in Atlanta, you don’t want to miss a trip to the Georgia Aquarium. If you decide to experience the animals up and close and personal as a diver or swimmer in the main exhibit, it just might be my husband who acts as your tour guide in the water! Wow, what a great story. And how true, stop waiting for the “how” to line up, and just work on the “what.” I have a good day job, but I want to be a voiceover artist. I have given up wondering how to quit my job or how I’m going to make it all work or how to replace my income, and I’m diving (no pun intended) into voice overs head first, and it will become what it becomes. I can’t wait to see where I’m at a year from now. Nothing happens if you are trying to figure it all out in your head, it happens when you take steps to make it happen. Congrats to Drew!! Greetings, Janet! Thanks for the nice note. In addition to giving up the questions about HOW things will happen, I’ve learned you also have to stop thinking about WHEN they will happen. Like you said, it happens WHEN you take steps to make it happen. However, you’ll never know which step will lead to the success you desire (another way to say how) or when the forces of the universe will conspire in your favor. You just have to keep putting one foot in front of the other and going in the direction of your dream. The WHEN about dream fulfillment will occur when you least expect it! Thanks again for stopping by, and best wishes for your continued health, prosperity, and success!